Overview - In a dusty, underpopulated California resort town, naive southern waif Pinky Rose (Carrie's Sissy Spacek) idolizes and befriends her fellow nurse, the would-be sophisticate "thoroughly modern" Millie Lammoreaux (The Shining's Shelley Duvall). When Millie takes Pinky in as her roommate, Pinky's hero worship evolves into something far stranger and more sinister than either could have anticipated. Featuring brilliant performances from Spacek and Duvall, this dreamlike masterpiece from Robert Altman (Short Cuts) careens from the humorous to the chilling to the surreal, resulting in one of the most unusual and compelling films of the 1970s. Strip us away of everything else -- our possessions, friendships, and even freedom, and we are still always left with one last thing, our own identity. No matter what is done to us, no matter what injustices or horrors we face, there is always one constant. We are who we are, and no one can take that away. Or can they? Perhaps it is because personal identity seems so safe and sacred, that films which examine dilemmas of inner being cause such unease and tension. If even the very reality of who we are is just as fragile as our own flesh and blood, then perhaps the dividing lines between human beings are much thinner than they would at first seem. These are some of the ideas that Robert Altman experiments with in his ambiguous psychological drama, '3 Women.' With some strong performances and a distinct visual style, the film manages to create an eerie sense of intrigue and discomfort, but its obscure plotting and methodical pace are certainly not for everyone. The loose story follows Millie (Shelley Duvall), a cheery enough but mostly lonely young woman, who befriends a rather harmless but slightly odd new girl at her work, Pinky (Sissy Spacek). Pinky eventually moves in with Millie and soon begins to idolize her roommate. After an unfortunate accident, Pinky's behavior starts to shift and the story takes on a fairly dark and almost surreal tone, becoming an oblique examination of the fragility of ego. At its core, this is really a character study (or really a literal study of character itself), and the performances from Duvall and Spacek end up carrying the picture. Millie seems like a fairly friendly and personable woman, but for one reason or another, most people seem to dislike or completely ignore her. Duvall brings a level of insecure denial to the character, putting up a false wall of confidence that hides a rather heartbreaking and even pathetic soul. Indeed, while she has some things going for her, Millie just can't seem to do a good job at being Millie, and as the film continues, we wonder if perhaps someone else could do better. In contrast to Millie's distinct personality, Spacek's Pinky is more of a blank slate. At times she seems like a lost puppy dog following her master around with bright-eyed enthusiasm. As Altman so wonderfully describes in the included commentary, she has an almost alien quality, as if always quietly asking herself, "How do I make myself a person?" Spacek's wide eyes alternatively reveal a childlike innocence and a sometimes crazed psychosis, and her gradual transformation is handled with just the right amount of subtly and unease. The relationship that forms between the two women is uncomfortable to watch, and while their interactions are mostly innocuous, there is always a sense that something "off" is right about to happen, and when it finally does, the results are certainly… interesting. Though a slightly atypical effort from Altman, there are still many of his usual directing trademarks visible throughout. The filmmaker often shoots his characters from a distance, giving an almost voyeuristic feeling to the proceedings. Slow pans and zooms all help to bolster the drawn out, deliberate pacing and uncomfortable, dreamy atmosphere. Mirrors and reflections become a constant visual motif, furthering the film's themes of misplaced identity. Strange murals of reptilian-like creatures also show up frequently throughout the sets and production design, presenting bits of stark and disturbing symbolism. One dream sequence near the end of the picture descends more overtly into the surreal and offers a variety of striking but perhaps overdone visual effects and manipulations. While well crafted on many levels, there are still several aspects of '3 Women' that never fully come together. Altman admits that scripting was not much of a focus here, and indeed the film relies more heavily on character interactions and tone than logical plotting. There is a kind of slow build throughout the running time that seemingly suggests that all of the sinister trepidation and creeping strangeness is working toward some greater whole. While the movie does effectively move toward a dramatic climax of sorts, true meaning and purpose still remain elusive. Intentionally cryptic and inherently without answers, it is up to the audience to draw their own conclusions and make their own connections, which may or may not sit well with potential viewers. Also, though the film is called '3 Women,' the third woman in question (Janice Rule) is a bit underdeveloped and mostly disconnected from the overall arc until very near the end. Echoing the likes of Ingmar Bergman's 'Persona,' '3 Women' is a pensive and dark examination of identity. As once parasitic relationships become symbiotic, and various role reversals transform the core tenants of its characters, the film takes on an otherworldly quality that is both refreshingly and frustratingly ambiguous. Altman's film might be more effective in its moody set up than in its vague follow through, but the experience is still mostly worthwhile. 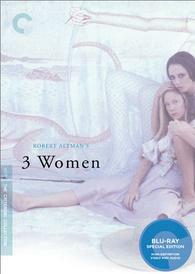 Criterion brings '3 Women' to Blu-ray in their standard clear case with spine number 230. The BD-50 region A disc comes packaged with a booklet featuring an essay by film critic David Sterritt. The movie is provided with a 1080p/AVC MPEG-4 transfer in the 2.35:1 aspect ratio. Though seemingly authentic and true to the filmmaker's intentions, '3 Women' doesn't really offer a traditionally impressive image. The print is in good shape, with only a few sporadic specks here and there. Grain is visible throughout giving the transfer a nice, film-like look. The movie features a very soft appearance, however, that can give the image a frequently hazy, fuzzy quality that lacks fine detail and depth. This seems to be a result of the original photography, but it does hamper the overall pop of the image and sort of washes out overall clarity. Colors are fairly muted and subdued throughout, though there is some vibrancy sprinkled here and there, especially with some strong uses of purple and yellow. Black levels look a hair elevated in some nighttime shots, but are solid for the most part. Contrast levels are natural and fitting. While the actual transfer seems to accurately represent the film, the resulting image's soft focus and sometimes fuzzy appearance lacks substantial clarity. With that said, the transfer is proficient and the hazy photography works well with the uneasy, dreamy content. The audio is presented in an uncompressed English mono PCM track with optional English subtitles. Though it certainly doesn't stand out in any way, the mix gets the job done just fine. Dialogue is clean and has a decently full quality. The sound design itself is rather subtle but effective, and though relatively quiet, there is some welcomed use of ambient effects and score. Dynamic range is pretty flat but there is no distortion. Bass activity is mostly absent and balance between the audio elements is fine. The uneasy musical score comes through well, with some decent but not particularly good fidelity. This is a very basic audio mix that serves the film just fine and offers a bit more fidelity than many older mono mixes. Criterion has put together a pretty slim collection of supplements, with only a commentary, trailers, and stills. All of the extras are provided in 1080i with English Dolby Digital mono sound and no subtitle options unless noted otherwise. Audio Commentary Featuring Director Robert Altman - Recorded in 2003, this is a very informative and pretty interesting track. Altman comes across as laid back and intelligent, and offers a frank and insightful discussion on the film and filmmaking in general. The director provides details on the story (which was actually based on a dream he had), working with Duvall and Spacek, the deeper themes of the plot, and his visual style. Altman admits that some aspects of the movie can come across as pretentious (he isn't quite happy with the dream sequence) but likens the picture to a painting more than a piece of literature. Full of some interesting bits of trivia and filmmaking philosophy, this is a very worthy listen. Stills Gallery (HD) - A very extensive gallery of production photos and behind-the-scenes stills are presented in 1080p, including some nice shots of the various murals seen in the movie. Theatrical Teaser Trailer (HD, 1 min) - The film's theatrical teaser trailer is presented in 1080i. Theatrical Trailer (HD, 3 min) - The film's theatrical trailer is presented in 1080i. TV Spots (HD, 1 min) - Two thirty second TV spots are included that do a fairly poor job of promoting the movie. '3 Women' is a cryptic examination of the fragile nature of human identity. While its slow pace and puzzling mysteries aren't for everyone, Altman still crafts an interesting piece of cinema. The video quality is authentic but a little fuzzy, and the audio is solid but unimpressive. Supplements are lacking, but the director's commentary is certainly worth a listen. While not the strongest disc, fans of Altman or more ambiguous styles of filmmaking should definitely check this out.